Over on the excellent 15mm science-fiction focused Dropship Horizon blog, a rather startling notice that Mark, the blogowner, is planning to “bring the tyres to a halt and turn off the engines for the final time“. The pace of posting had slowed slightly over on Dropship recently, but with interesting developments still going on in 15mm SF, it’s unfortunate to see Dropship Horizon shutting down so abruptly. Hopefully Mark leaves Dropship up and running even if he isn’t actively posting, as his links and articles are an invaluable resource for 15mm SF gamers. Having done basically nothing with this website for quite a number of years before reviving it late in 2010, I certainly understand that people’s gaming interests wax and wane and sometimes it’s time to move on, but even a somewhat dusty resource is better than nothing — Dropship’s collected information can still help 15mm SF gamers for years, as this site was doing even during the years I was neglecting it. Best of luck to Mark in his other gaming interests, and here’s hoping that some day in the future he relights Dropship’s engines, brings up her running lights and starts posting cool 15mm SF things again! 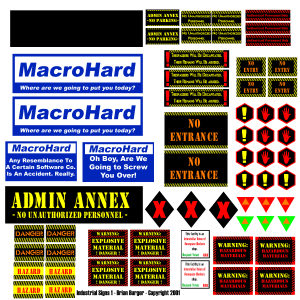 This zip file contains two very detailed, 1200dpi images in Adobe Photoshop PSD format, with lots of varied industrial & safety signs to decorate your industrial scenery and buildings. 15mm science fiction (Stargrunt II, specifically) was one of my starting places in miniature wargaming; I don’t do much these days but I still have all my figures and I still keep an eye on the field. These are great days for 15mm SF gaming, with a bunch of new companies involved with rapidly expanding ranges, as well as new stuff from established companies like Ground Zero Games. I used to maintain a long page of companies involved in 15mm SF – many people still link to it, so you might have followed a link expecting to find it, but I’m no longer as heavily involved in that scale & genre as I once was, so I’m going to refer you to Dropship Horizon instead. Dropship is an excellent blog devoted almost exclusively to 15mm science fiction gaming, and even better, on one of their right-hand sidebars they have a long list of 15mm Sci Fi Manufacturers! Dropship also has news and reviews of the latest and shiniest stuff from those manufacturers, some neat projects of his own, and a good group of commentators to boot. Go check it out! More refugees from the old site; I still like the graphic work I did on these shipping containers & crates. I might eventually do some more. No promises, though. If you are looking for the signage, see the Sci-Fi Signage post. PIZZA BOX SCENERY: This 25mm science fiction scenery was inspired by a 25mm pirate tavern from a now-vanished webpage. That one was designed for a tavern-brawl skirmish; mine is designed for SF skirmishing on space stations or other large indoor facilities. The two pizza boxes still fold up for travel & storage, and the various walls, columns & partitions were carefully laid out so they’d mesh together when the box was closed. The interior walls are mostly matte board, which is strong and thin – and it was on sale very cheap at a local art supply store! 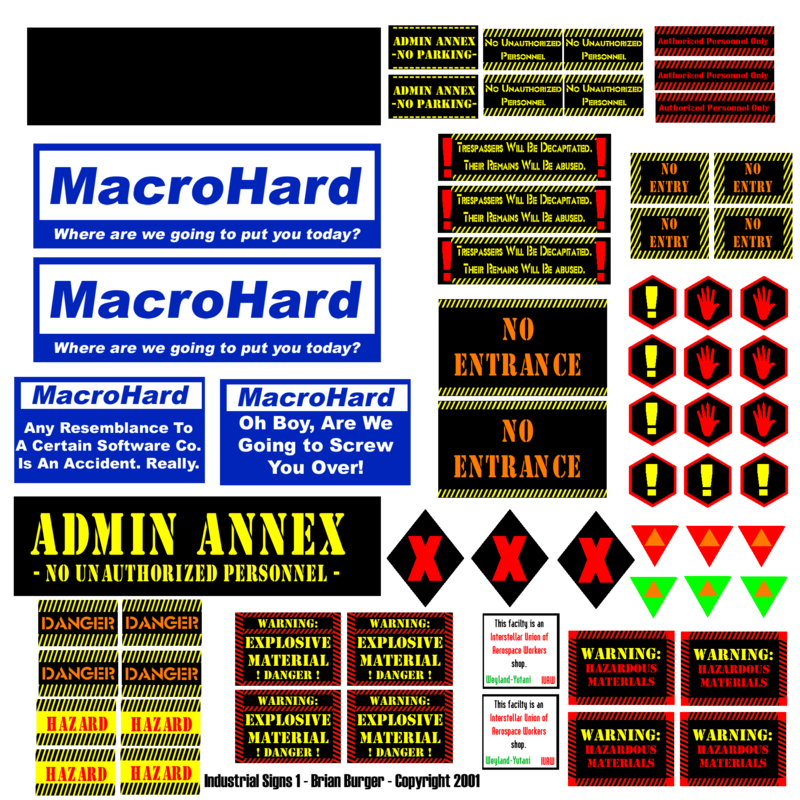 The hazard striping, signs & other decorative bits were printed off on my colour inkjet, and created in Photoshop. Some of them are available free on the Sci-Fi Signage post. Photos from September 2003 of GZG 25mm & 15mm United Nations Space Command troopers (in Martian Legion camo) and Alien-movie aliens from FreiKorp. More 15mm stuff from 1999-2000. Click for full/larger view.